Crypt Drapes are used when the marble is removed from the mausoleum before and during the entombment. They are made of 100% acrylic Hy-luster material. Crypt drapes are available in 4 different sizes with or without a spring tension rod. Crypt/Niche Vases are available in either spun bronze or high impact plastic. The bronze vases are available in satin bronze lacquer or Verde green finish and the plastic vase is available in metallic bronze, Verde green or gold. Both can be mounted using a saddle & button or ring hanging system. Plastic mausoleum beads are light weight made of high impact polystyrene and are round in shape for an easier crypt entombment. Minimum order 20 pounds. Glass mausoleum marbles are used in place of crypt beads. 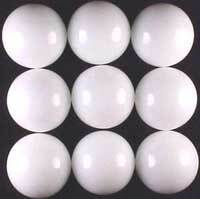 They are opaque in color and measure approximately 9/16" in diameter. Minimum order 1000 pieces per box. Crypt Sealers are produced of high impact, high density polystyrene and is reinforced with twice the amount of ribs for a strong, rigid installation. Available in: 31 ¾” x 26 ½”, 32” x 26 ½”, 33” x26 ½”, 33” x 26 ¾”, 33 ¼” x 26 ½”, and 33” x27”. The sealers can be trimmed to accommodate other sizes. Caulking the grooves on all four sides on the unit will ensure a proper seal. The front is smooth and gray to match the concrete. Easily installed, this Crypt Sealer weighs only 5 pounds (marked for top). No minimum order required. Banish Deodorant Powder has the scent of fresh mint destroying odors caused by bodily fluids, decay, putrefaction, odorous gases, decomposition and odors caused by various malodor problems. Banish is available in a convenient 2 pound container. Recommend For: Mausoleums, crematories, disinterment, prep rooms, morgues, caskets, and body bags. Paulex deodorant powder has unlimited uses. It eliminates odors caused by infection, bodily fluids, decay, putrefaction, odorous gases, decomposition and odors caused by various malodor problems. Paulex is available in 1 pound containers and 25 pound pails. 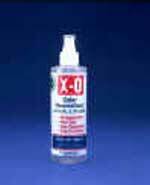 X-O spray can be used to combat unexpected emergency problems. Spray X-O on any surface for long lasting order control. Add X-O to any cleaning solution to keep surfaces odor free. X-O gives a neutral, refreshed, odor free environment within minutes of application. X-O is available in 4oz, 8oz, 32oz and 1 gallon containers. Recommend For: Mausoleums, crematories, prep rooms, offices, vehicles, morgue, caskets, body bags, bathrooms, and carpets. 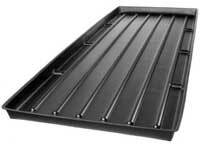 Casket Trays are durable, long lasting, and is manufactured of high density polyethylene. The I.D. dimensions are 29" x 85" with an O.D. of 31" x 87" x 3" high with a lip. The O.D. can be trimmed to 30" x 86" for smaller crypts. The lip that goes around the tray allows for easier handling. 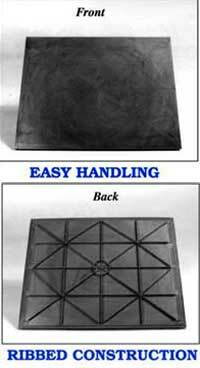 Trays nest for space-saving storage and shipping costs. 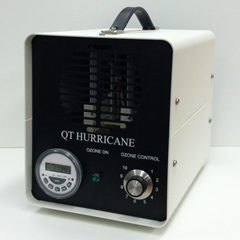 Queenaire products are designed to naturally remove even the most stubborn odors in your prep rooms, viewing rooms, lobbies, transportation vehicles and throughout your facility. powerful odors without the use of artificial chemicals or deodorizers? Artificial chemicals and deodorizers only mask the smell of malodors. And unlike Ozone, chemicals and deodorizers leave residue that can cause harm to the air quality while attempting to mask the odor. An environmentally-friendly ozone machine actually pro-duces ozone which ELIMINATES and DESTROYS the gases that are the source of the odor - leaving behind nothing but fresh, clean air.